British Airways has officially announced that due to increasing demand for its Riyadh bound flights from London Heathrow especially in the premium cabins, it shall be increasing its flights to the city for the IATA W11 season. Currently, BA operates 5 times per week using a Boeing 777-200ER, however from Oct 30th onwards, these shall be increased to daily services using the same aircraft type. Etihad Airways has officially announced that it shall be launching its 3rd new route in Germany i.e. Dusseldorf from 16DEC 2011 onwards. EY will be initially operating the service 4 times per week using an Airbus A 330-300, however from the on set of the IATA S12 season, flights shall be further increased to daily using the same aircraft type. Its main target market in DUS are pax bound to BKK, MNL, UAE, Iraq, IKA, China and Indian Sub-continent region. EY also announced that it will be increasing flights to EBL-Erbil, Iraq effective 30SEP from the current 2 weekly to 4 weekly flights all using an Airbus A 320. Quite a "coup de tat" for Airbus as this is a huge win for them. Boeing only managed to salvage approximately 40% of this order by hurriedly launching their own B737NG NEO variant otherwise it would have been a huge embarrassment for them seeing one of their top 5 customers jump ship. Make no mistake about it, these A320s bought by AA must have been massively discounted, so much so that if AA were smart, by the time they take delivery of these A320NEOs 6 years later, they can easily sell them off at a 30-40% profit margin. Now as far as what will AA do with these planes, it is evident that they shall be used to fully replace its aging MD80 and B 757 fleet which it has officially stated. However what is quite interesting to read is that also this order is also meant to fully replace AA's old B 767-200s. Taking all of this into consideration, it is quite evident that out of the A320 family that is on order, the only variants that AA will be ordering are the A320 and A321s; both normal and NEO versions. The A321s will be used to replace their B 757s and B 762s on all domestic and intra-America flights. As far as the B 737s are concerned, AA currently has only one type of B 737 in its fleet i.e. B 737-800s and that is most likely going to change slightly with Boeing 737-900ERs also going to be ordered as part of this mega order. The reason why one feels that B 739ER will be ordered by AA is because like the A321 it has the same on board capacity of the B 757 + B 762 but it has a greater flying range than the A 321! Concluding, due to the current seating configuration of its MD80s, B 737s, B 757s/762s, one can rule out AA ordering the A319s and B 737-700s! IST - frequencies increased from 4 to 6 times per week using a B 772ER. BOM - frequencies increased from double daily to triple daily. CAN - frequencies increased from daily to double daily flights using A333s only. AMD - frequencies increased from 2 to 3 weekly. BAH - frequencies increased from 4 to 5 times per week. AUH - frequencies increased from daily to 9 weekly. ORD - frequencies increased from 4 to 5 times per week. RUH - frequencies increased from 6 to 8 times per week. HBE - frequencies increased from 4 to 5 times per week. SAH - frequencies increased from 3 to 4 times per week. KRT - frequencies increased from 6 weekly to daily. ADE - frequencies increased from 2 to 3 weekly flights. DXB - capacity increased from daily A 333 + daily A 321 to 11 weekly A 333 + 3 weekly A 321. JNB/CPT - frequencies increased from 5 weekly to daily flights using an A 333. JFK - frequencies versus W10 increased from daily to 11 weekly flights i.e. 4 weekly A 333s + daily B 773ER. 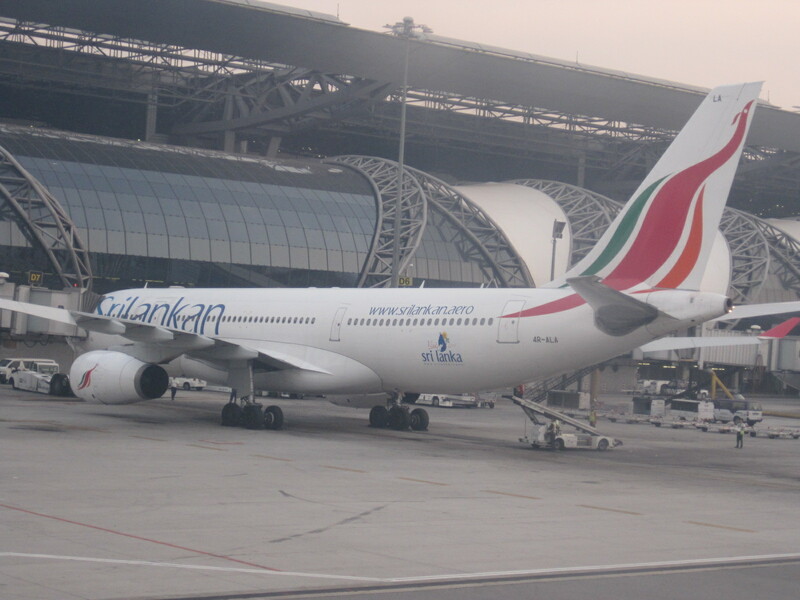 DEL - capacity reduced from daily A 333 to daily A 332. BOM - capacity increased from daily A 332 to daily A 333. GYD - frequencies reduced from 4 daily to 24 weekly. SGN - capacity increased from 3 weekly A343s to 3 weekly B 773ERs all operated via BKK. NBO/DAR - capacity increased from 3 weekly A 332s to 3 weekly A 333s. LOS - capacity increased from daily A 332s to daily A 333s. CTU - 4 weekly flights to be operated with a B 744 Combi to take advantage of the booming air cargo market. DMM - frequencies increased from 4 to 6 times per week using an A332. DOH - frequencies increased from 4 to 6 times per week using an A332. GRU - capacity increased from 4 weekly B 773ERs + 3 weekly B 772ERs to daily flights using a B 773ER only. Thai Airways has officially announced that due to stiff competition for its Sydney flights, it will be reducing frequencies to the city effective 01AUG 2011. From the currently flown 18 times per week nonstop from BKK, TG will reduce the service to double daily only using an A 340-600 for both the flights. HKG - frequencies increased from 5 weekly to daily A 346s. BOM - frequencies increased from 5 weekly to daily A 343s. JFK - capacity reduced from daily A346 to daily A333. GRU - frequencies increased from 5 weekly to daily A 346s. SIN - frequencies increased from 5 weekly to daily A 346s. Oman Air has officially announced that it will be increasing capacity to both Colombo and Male for the IATA W11 season effective 30OCT onwards. Both routes will be getting dedicated terminator flights rather than tag on flights and as a result MLE will be increased from 5 to 6 times per week using an A 333 5 times per week + weekly B 738. In contrast, CMB will be reduced from daily to 6 weekly but due to it being a terminator flight, capacity will be increased with 2 weekly A 332s + 3 weekly A 333s + weekly B 738.